VTLA's Women's Caucus is a platform for increasing the leadership role of women within the Association, furthering VTLA's educational goals, mentoring women attorneys, providing its members with a professional and social support network within the Association, expanding the membership of VTLA and doing all things necessary to uphold and maintain the high standards of the legal profession and the administration of justice in the Commonwealth. All female members are automatically part of the Caucus and are eligible to participate in its listserve. 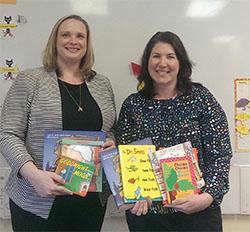 Members of VTLA Women's Caucus delivering a collection of children's book that were donated at last year's convention. 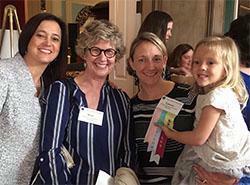 Stephanie Grana, Barbara Williams and Lauren Ellerman (plus one!) enjoy the Women's Caucus reception at the 2017 Convention. Amy Griggs welcomes the inspirational speakers at the Women's Caucus luncheon at the 2017 Convention. 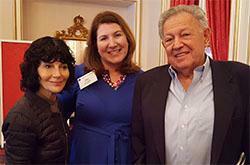 Phil Hirschkop and Nancy Buiriski brought the house down. 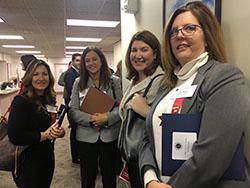 Bridget Long, Stephanie Grana, Amy Griggs and Joanna Suyes visited legislators on VTLA's Justice Day 2017. 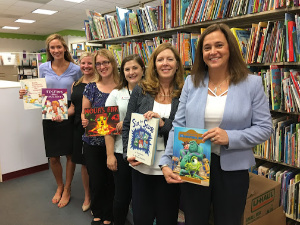 VTLA Women's Caucus collects children's book donation each convention and donates to various non-profits to encourage young readers.